Certified Thermal Model Reports for Various Wall Assemblies Available. HTT Reduces Wall Stud Pricing by $0.70 per Linear Foot — Contact Us for Adjustments to Recent and Upcoming Project Quotations………Steel pricing is changing rapidly, so it is important to Update your prices! Hi-Tech Tilt™ is the technology breakthrough of a 16ga. structural metal stud combined with W.M.F. steel reinforcement embedded in a standard 2″ concrete slab used in both floors, & walls (with load bearing capabilities). Hi-Tech Tilt™ is a patented composite building technology. The Hi-Tech Tilt™ panels are framed with metal studs and track. 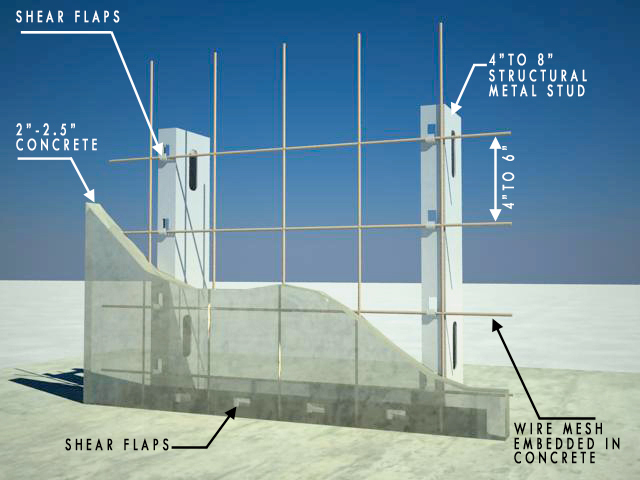 The walls can be pre-fabricated in a plant or cast on-site on the building slab. The concrete skin is 2″ thick. The studs and track are usually 2″x6″- 16 gauge. The steel is attached to the concrete by tabs that are punched out of the side flange of the studs and track. The tabs are punched 4″ to 6″ O.C. as recommended by the structural engineer. The tabs are embedded into the concrete by using the building slab as a casting bed, similar to tilt-up casting methods. The panels do not use rebar but use wire mats. The resulting product is a structurally sound building panel that contains a finished outside surface with a studded inside face, ready for finish-out. Our inside ready frame allows all utilities (electrical, plumbing and HVAC) and insulation to be installed before drywall is screwed on to the studs . The outside can be cast with feature strips or any decorative reveals. There are various methods of creating a thermal break as required by some architects. This patented technology forms construction panels stronger-but-lighter than solid concrete, concrete block. The bonding and adherence of the concrete to steel becomes a very strong composition of conventional products which provides you a competitive edge over tilt-up and other building systems, allowing you to build stronger buildings faster and at a lower cost.